You must also show proof of economic solvency for a minimum of US $500.00 upon entry. NOTE: Please make sure you have a minimum of three months of validity left on your passport and a round trip ticket. 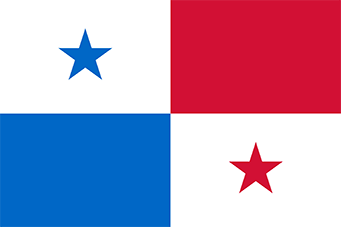 The maximum amount of time that you can stay in Panama is six months. If you want to stay longer than six months, you may extend your visa with the Offices of Immigration in Panama. If you are from one of the following countries and do not qualify for the visa waiver mentioned above, you will need an stamped visa. A valid, signed US passport. The passport must have at least 6 months remaining after the completion of your stay in Panama. Copies of all the pages of your passport. Copies of any other form of valid I.D. you have issued either by your home country or the country where you reside. Proof of economic solvency during stay, (No less than USD$500.00) This can be verified with one or more of the following: Certified bank checks with applicant’s name, Travelers check with applicant’s name., Applicant bank statements from previous three months, Applicant credit card with statements from previous three months, Letter from employer that reflects your monthly wage. (must be translated to Spanish), Tax returns from previous fiscal year, Any other reasonable proof of income accepted by the National Service for Migration. Certified check or money order for US$60.00 made out to **Consulate of Panama. Panama Tourist visas are usually valid for a stay of up to 30 days. Application for extension of stay may be made to a Panamanian Immigration and Naturalization Office in Panama.